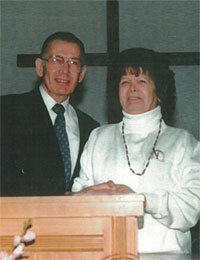 This is a picture of the author, Dorcy Thomas and her husband, Jerry. Dorcy had a burden for writing this book because her heart goes out to all who suffer anxiety and panic attacks, having been housebound by agoraphobia but now 90% recovered. Jerry and Dorcy have been happily married for over fifty-two years, overcoming many trials. They attribute their success and results to much prayer and giving the Lord all the glory. Dorcy and Jerry pray that the material of this book will help everyone suffering from anxiety and panic attacks, and that their lives will be more comfortable and fuller. Work the “Baby Steps” and look toward a controlled and understanding life of your own. You Just Don’t See the Wheelchair, a hopeful and encouraging book, is available in both hardcover and paperback. Copyright © 2019 Dorcy Thomas.